Flying in and out of Noumea doesn't take long as a quick trip from Sydney or Brisbane. 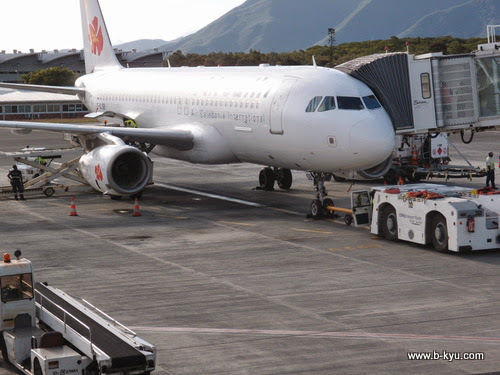 Here's a few airport tips for arriving and departing and a run down on flying Aircalin. We're not sure we should tell you all about New Caledonia. We've been a few times now and each time we like it more. It has such a different feel about it compared to the parts of Asia we've travelled through. Some folks are surprised when we mention we are heading back again, 'It's so not like you!' we hear, or 'But I've heard it's so expensive!' Yes and maybe. 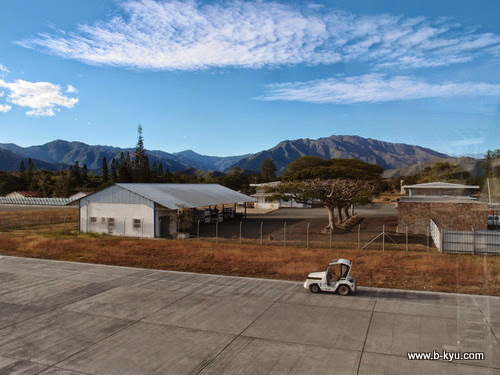 Here's a brief run down of our experiences flying and getting to and from the international airport, just in case you decide to head out to the islands. 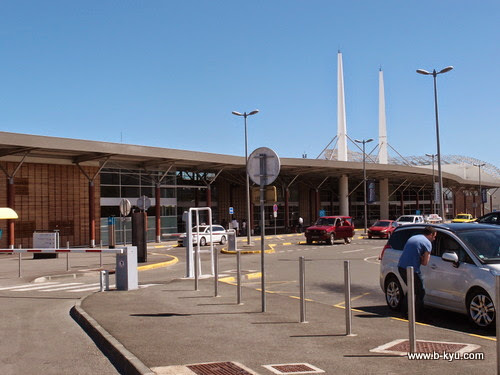 The experience of arriving at La Tontouta International Airport is an early indicator of the laid back New Caledonia style you're going to enjoy. The airport is unhurried, there are only a few taxis (be warned), a few people waiting for arrivals and a couple of stores are open. A handy tip for arrivals on the weekend - there are no takeaway alcohol sales at supermarkets and small stores after midday on Saturday and Sunday, so if you arrive late morning or afternoon, as you are coming through duty free grab some beer (there are six packs available), wine or booze of choice so you can enjoy it later on to celebrate the start of your trip. There are no shops after customs or in the terminal that sell takeaway alcohol, it's your one shot before you go through. Once you get your luggage (and booze) and hit up the ATM inside its off to find your transport into town. The airport isn't close to Noumea, you're going to have to work out some sort of transport option. 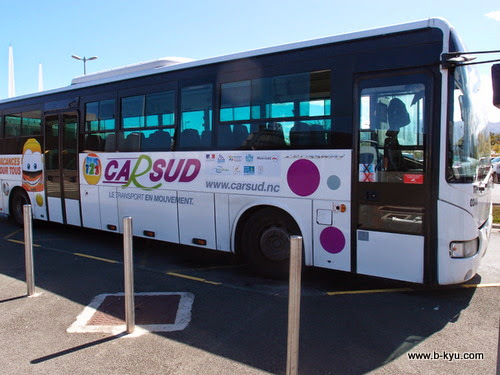 You could book ahead for a pick up (try Arc en Ciel), pay when you arrive (3000 cfp each person for the trip direct to your hotel), or take the adventure route and go on the local bus. This is the only indication of a public bus stop at the airport, you wouldn't know it otherwise. It is just outside the exit, across from the private bus shuttles. 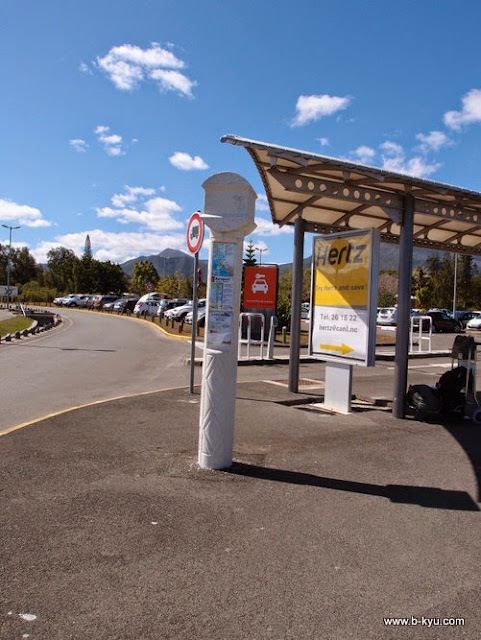 You'll see these bus stop poles all over Noumea. 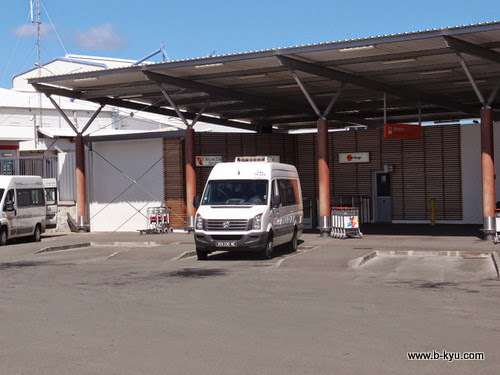 We have used the local bus to get into Noumea from the airport twice now. It's arrival is timed quite nicely at about half an hour after the plane from Sydney arrives. At only 400 cfp, (about $4.70) it makes a big saving from the shuttle which can end up over $30 AUS each. It is good to have some some small notes or coins as the bus won't take large denominations of notes. We have a fascination with trying to get the local transport when we arrive in a new place, you get right into the feel of a place as soon as you are off the plane. The bus trip through the country to the city takes over an hour, but if the driver has a good selection of music playing it takes no time. Bus drivers love reggae done island style, all you need is a fruity cocktail to slink into holiday mode. 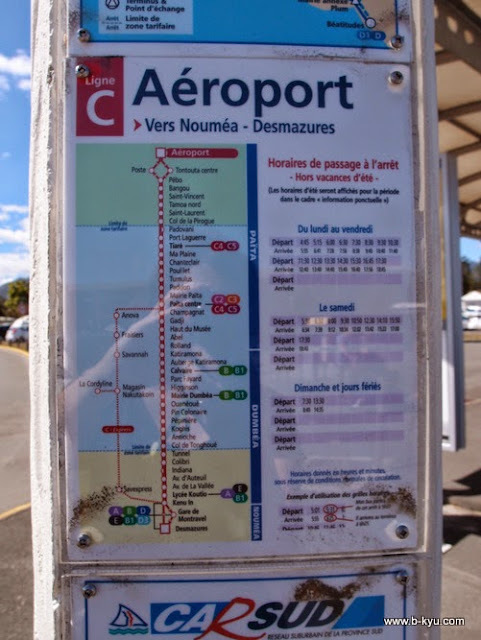 On the big white pole is a timetable for the bus into Noumea. There's a time the bus arrives and departs, it usually waits a little while before it heads off. The map at the bus stop shows all the routes this regional bus line takes (unintentional portrait done there as well). 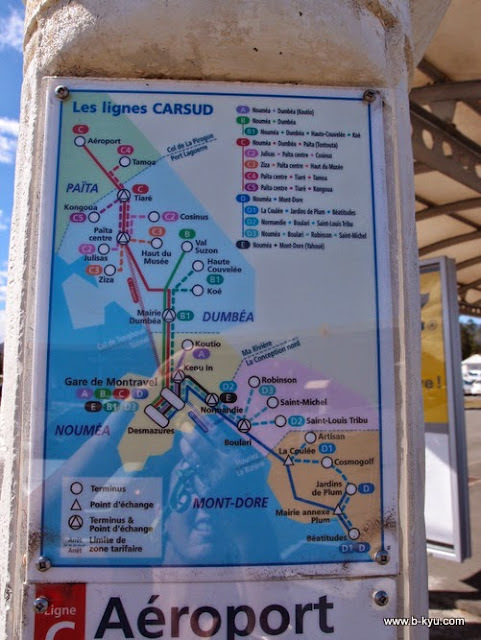 The airport line is Red C. In the past we have been told to get off at the interchange at Gare de Montravel so we can connect through to Anse Vata, where we normally stay. The bus interchange there is a little deserted, without much information about where to go or anyone to ask (especially if you don't speak French), so we suggest getting off at the last stop of Desmazures and walking through Noumea town centre to the tourist office who can direct you to the nearest stop, or get a cab to your hotel from there. The Desmazures stop is also the best if you are staying at the Auberge de Jeunesse hostel, it isn't far to walk from there although the hill is really steep. The buses are big and comfortable, there's plenty of room for luggage. The other alternative to going the public bus route is to take one of the small private shuttle services. It takes about an hour to get to your hotel, as it depends on where all the passengers are going. Lastly, you could get a taxi, but expect to pay about $100AUS and not really save that much time. On our way back we take the faster route and opt for the hotel shuttle bus. More time for the lounge! 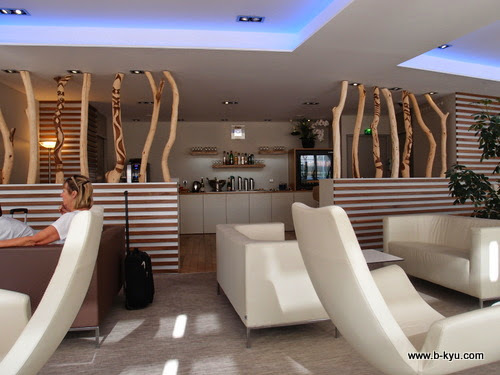 The lounge is not a dedicated Qantas one but is pleasant to spend some time in. There is Mumm champagne and a small selection of spirits (a little clink of ice and a shot of Chivas sure helps the nervous flyer) as well as beer. There really isn't a lot of food, a few sandwiches, nuts and cookies for snacking so don't expect to fill up before the flight. 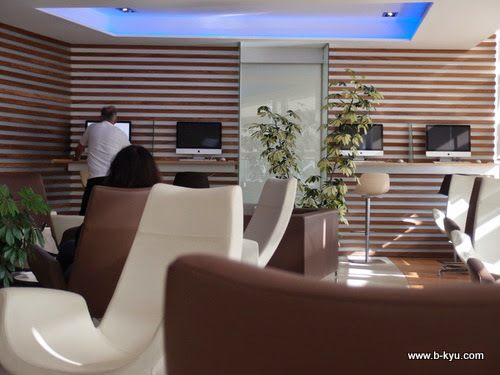 The lounge is quiet and equipped with computers for browsing. Compared to what is available in the rest of the airport (nothing was open when we departed), the lounge is a bit of a godsend. 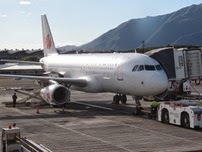 Aircalin (Air Caledonie) fly codeshare with Qantas from Australia in the smaller Airbus A320. 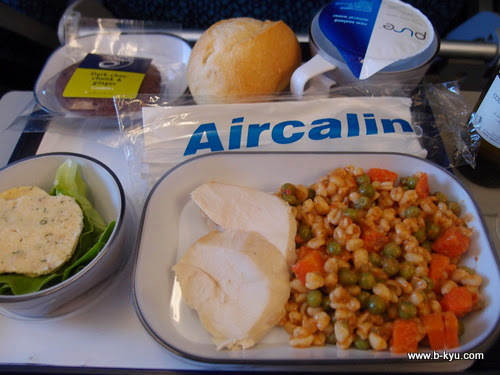 We usually fly back to Sydney on Qantas but if you are flying back to Brisbane it's an AirCalin service. It's a striking scene at the airport with low lying mountains in the distance. The configuration on the plane is three seats / aisle / three seats which is comfortable. 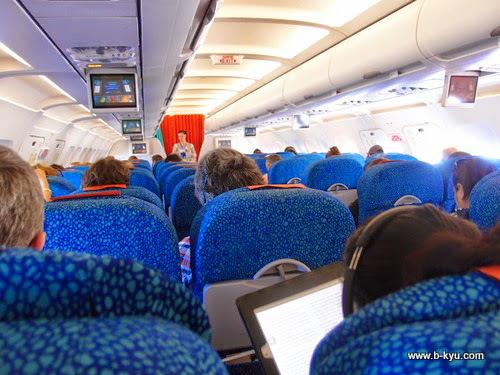 There are no screens on each seat so your own entertainment is useful. I love how flying breaks you from the ability to check emails or mindlessly drift around the information superhighway, bringing in wifi for flights makes me kind of sad to lose this forced downtime. The flight is only just over two hours. 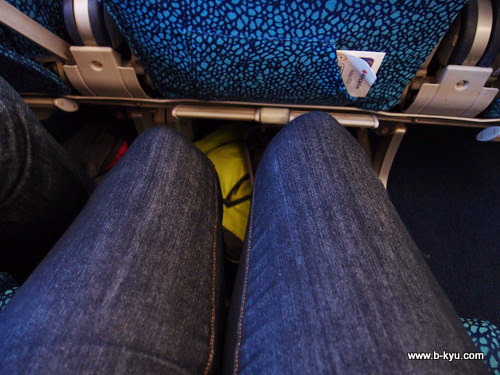 There's a fair bit of legroom, more than the economy flights we've had in Asia. Booze! 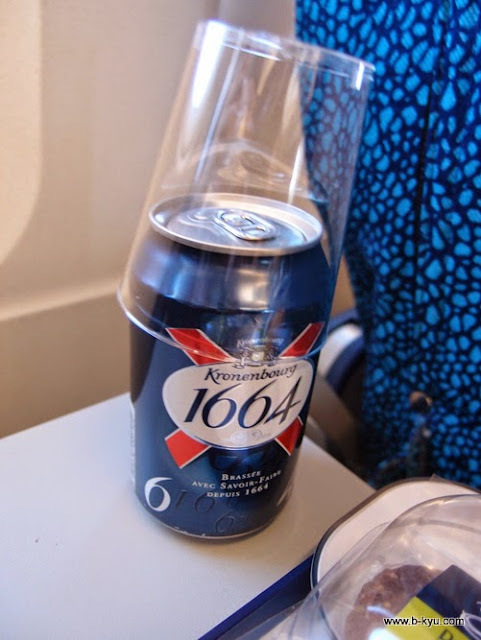 A cold Kronenbourg or a glass of French wine helps you withdraw from the holiday mindset, back to reality.